This set my base weight at roughly a little over 11lbs. I loved each of these items and trust me put a lot of thought into each item. The Gregory pack for it’s great fit, comfort and rocker system in the waist belt and shoulder straps. This saved me from any rubbing along my hips and lower back that cause chafing and blisters. It also works as a top load as well as having a zipper across the whole front of the pack so you don’t have to dig only from the top to get at stuff on the bottom. 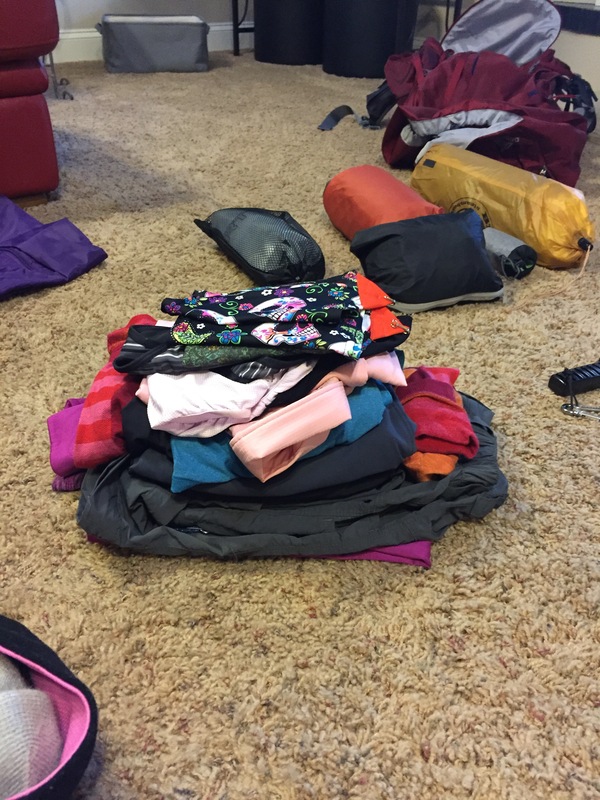 It has a great sleeping bag (inside) and tent (outside) area at the bottom as well as a ton of pockets and one waterproof pocket on the waist belt that fits your phone in perfectly. (not that we had ANY service, but did use my iPhone for pictures) it can also hold a water bladder (I didn’t do this) and came with a slack pack, that I DID use for our Mt Whitney summit, plus a rain cover, that DID come in very handy and kept everything perfectly dry during the stormy weather. The BA tent…well because it is ultra light and the perfect size for 2 people or a girl and her gear in the rain. It held up great, kept the rain and wind out and I loved being able to have the fly off for a “moon roof” to watch the sunset and the starts rise each night. The BA sleeping bag was AMAZING! Super warm mummy type but fit to a woman’s body. I had a lot of foot room in this bag, which is unusual for a mummy-type bag. I never felt the confines of a typical mummy. It has a great little neck collar thats super soft and really holds the heat in if needed. 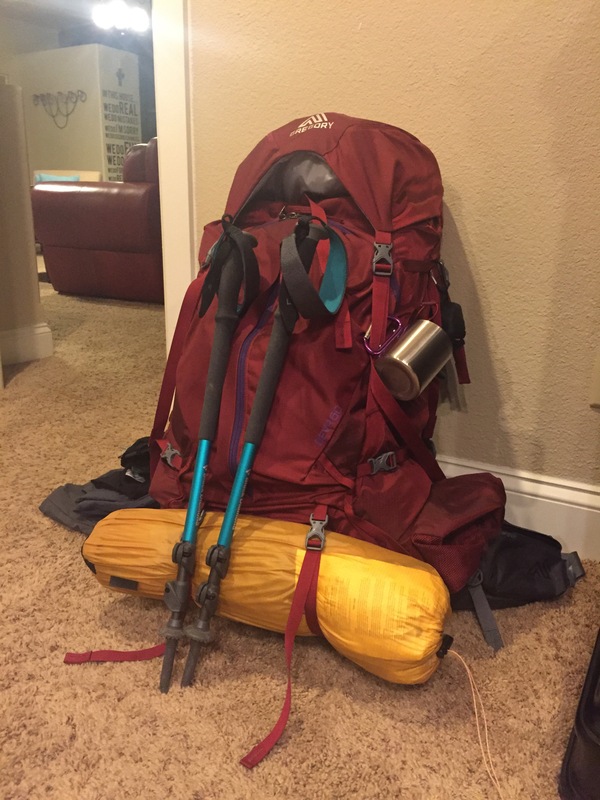 At a 25 degree rating on this bag it was about perfect, although I did have about 4 nights on the JMT that I got a little cold. Nothing that putting on my beanie and snuggling and “mummy-ing” down didn’t solve. Most nights I got warm and had to have my upper body outside the bag until the early mornings when I would snuggle back down in because of the cold. The Therm-a Rest was great. Flat enough that it rolled up super small and I was able to fit it into the upper “brain” side pocket in my pack. 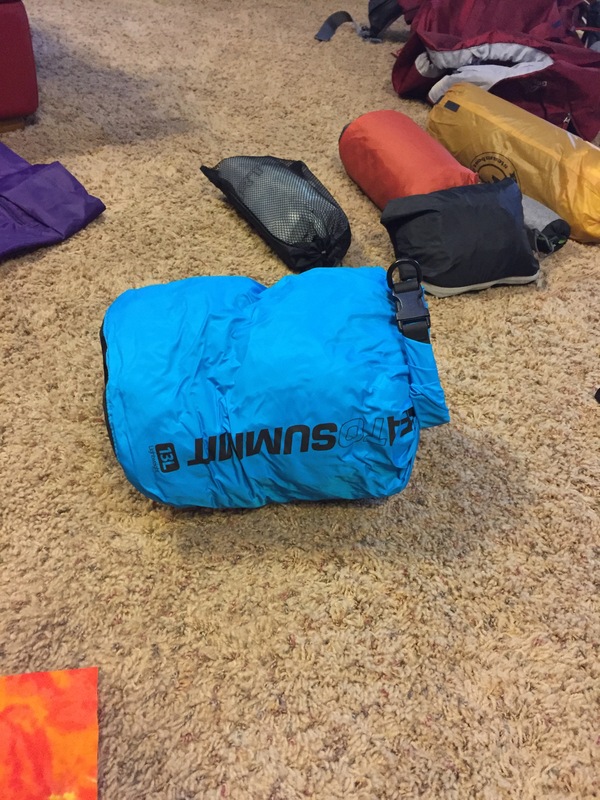 It inflates fast, and has a 2.4 R-Value which kept me plenty warm and off of the ground. Some nights I did wish I had a little extra padding underneath me, but sleeping for 3 weeks on the ground in the Sierras will do that to a girl! As I packed my backpack (this took a while, which is NOT normal for me as I am typically a 10-20 hour in advance packer for ANY trip) I knew God was speaking to me about things unnecessary. Extra baggage. Extra weight (and I’m not talking scale weight) The excess things we allow to cloud our life. To get in the way of happiness. To get in our way of hearing from Him. All that extra stuff. The junk we pack along every day, that we allow to weigh us down. He was already working on my heart….. Already whispering things that He would continue to bring forth to me along the trail. Things that honestly I’ve shelved but for some reason, every-so-often I pull down, dust off and look at. Things that on occasion, although I know are things of the past, I feel I need to shove into the backpack to drag behind me for a while. Why was God asking me to look at these things again? To unpack. Again. THIS I KNOW Romans 8:28 says, He uses all thing for the good of those who love him. ALL things. Not things, here and there. Not only good things but messy things, sad things, hard things. Abuse, neglect, health issues, mental illness, death, life, depression, anxiety, despair, shame. He uses ALL of it. This is one of my favorite verses promises, and it has always brought me a great deal of healing and comfort. I know that God’s promises are true and that brings me a lot of peace. One of the notes in my Bible says, “he is not working to make us happy but to to fulfill his purpose” So, as I’m packing and He’s unpacking I feel a sense of relief, because I know that even though I feel that maybe we are going to head into the wild to upheave and hash things out, things that sometimes I would just rather forget, HE has a plan. He has a use for things that I may think are irrelevant. I know that through the things I’ve lived out in my life, HE is in control and will use me as a conduit of his love and compassion for others traveling through the same things. Have you ever felt despair? Because I know I have. Have you ever felt alone or ashamed? Maybe SO broken that you feel hopeless? Unwanted? Not enough? I have too. But I also know that God is a healer of the broken and the shameful. He’s a wanter of the unwanted and a hope to the hopeless. He can and will use that. Through Him all things are possible. There is healing on the other side. You see, we are not meant to live apart from Him. Clothing: 2 wicking tank tops. One REI Screeline tank, one Asics running tank. One long sleeved Columbia Sun Goddess blouse with SPF (saved my skin) 2 pair Exofficio ultralight washable undies. 2 pairs of shorts; REI and Lululemon Speed Shorts 2 pair Darn Tough socks. One pair long REI hiking zipoff pants. One pair medium weight REI wool leggings (for camp pants and sleeping) One medium weight, long sleeved, winter running top (for camp, chilly mornings and sleeping) a beanie, gloves, sunglasses, Nike sport sandals (camp shoes/water crossing) my favorite Peace Within cap. Marmot down jacket . One pair of wool socks (for camp and sleeping) Black Diamond head lamp. REI rain jacket and rain pants. REI small absorbent, quick dry towel, soap leaves (for washing dishes and washing dirty bodies) All of this fit inside a Sea to Summit compressible 13 liter dry bag. 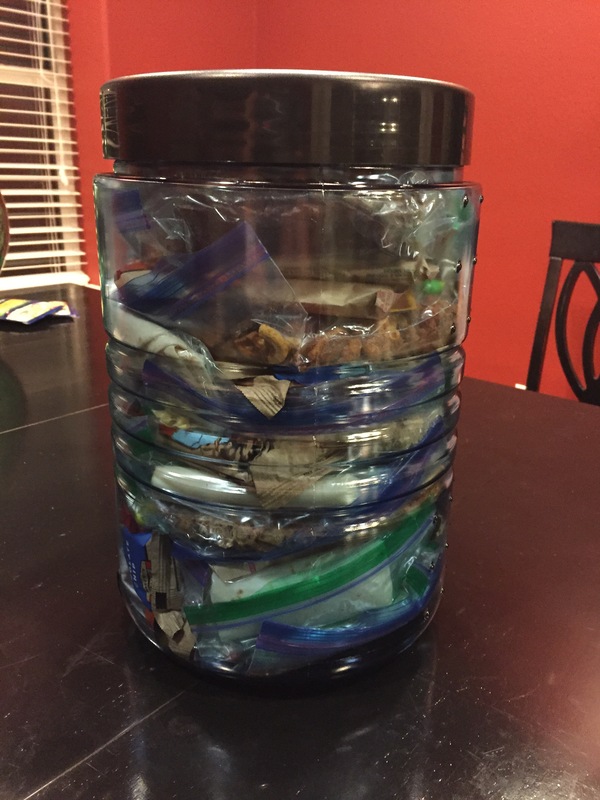 A Bear Vault 500 with 6 days of meals. We reaupplied food 3 times on this trip. We can talk food at another time. Black Diamond carbon fiber trekking poles. La Sportiva Synthesis Surround GTX hiking boots, Sugar Skull/Day of the Dirt Dirty Girl Gaiters Lucy solar charged lantern (used one time) First Aid kit (thank goodness) 1-1/4 piece of yellow bandana attached with a grommet as a “pee rag” a ultralight Cat Hole Trowel (yep) 1-turquoise bandana attached to the outside of my pack identifying me as a Lady of the JMT (and WOW were there a lot of us out there! Fun to meet each one of you) Jet Boil Flash with 1-100 gram fuel tank and 1-230 gram tank. Gravity Works water filtration system. 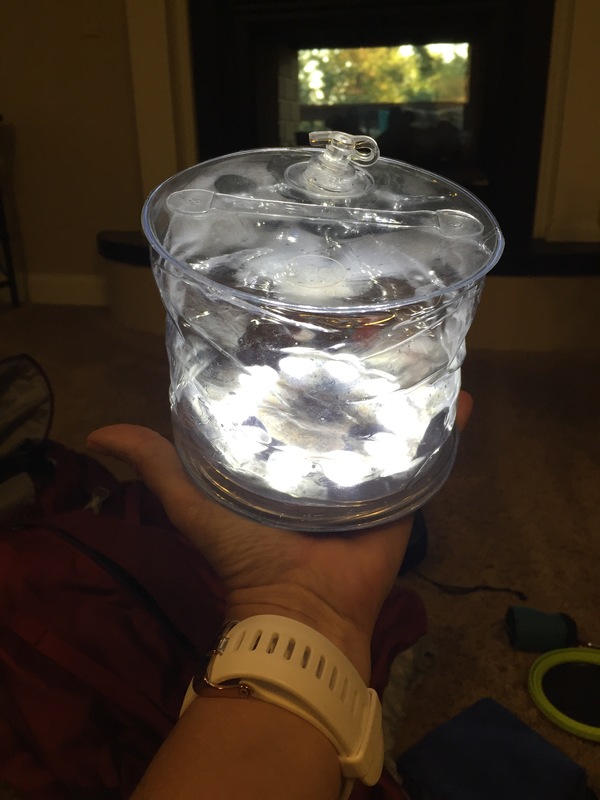 Small foldable bowl, retractable spork and stainless mug (that ended up somewhere at 11,924 ft on Glen Pass. In total my overall FULL pack was around 35-36lbs. I have had the JMT in my heart for so long. Thanks be to God for the courage it took to take the leap. To not look back. To not be timid and allow fear to grip me. To walk forward and not backwards. To not settle for status quo. To not allow people or society or my own “self” to get in the way. To not walk back into situations that are toxic only because it’s convenient. I have been down some pretty pitiful, lonely roads. I am thankful to a God that redeems. Who takes a timid bird and changes her into a lion chaser. Who knows the desires of my heart so well and has given me the roar for adventure. 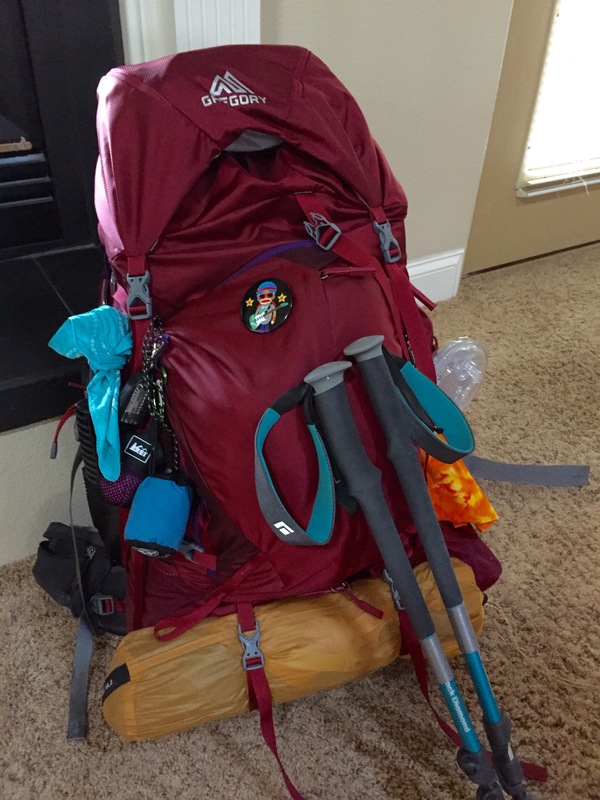 Come along with me as I continue this walk along 220-miles of the John Muir Trail.